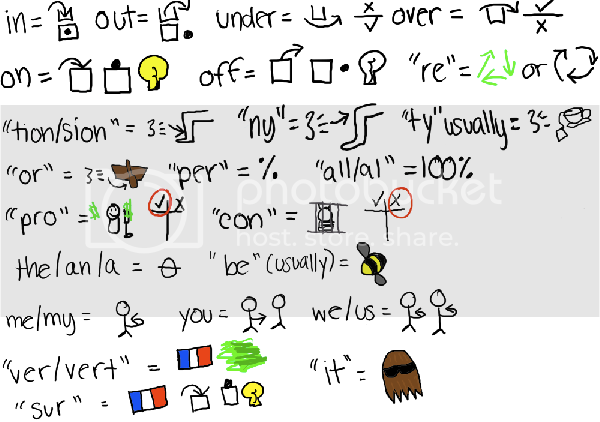 Discussion in 'Guides' started by element212, Feb 28, 2007.
these are some common symbols used in iSketch. the red under the leg says 'tion' because it sounds like shin.. sorry my handwriting is kind of bad. I have often seen 'of' drawn with an arrow pointing 'off' the table thingy from in, on, under. In rooms such a Movies, where there are lots of words, an apple represents 'a'. This is only allowed when 'a' is the whole word, not when 'a' is a part of another word. don't people use a circle with a horizontal line through it to indicate "the" ? Wow, that's really helpful. Just today, someone drew an "in" thing and I had no idea what it was. "The" is drawn as such because of the greek letter "Theta" if anyone was wondering..
"It" is derived from cousin it, from The Addams Family. The apple is also sometimes used to denote "Ap" in a syllabilized word, but more often used as the single word "A." An eye is also often used to denote the single word "I." Ah, I usually cross out short words like "an, the, of and with" in the syllables symbol. Expert and others: commonly used symbols and shortcuts. Sounds like is probably the most commonly used...it's handy, it means you can draw 'flower', for 'flour', for instance. Thanks, very helpful. Might come in handy for the game of iS tonight. It's allowed if the word is "I" or "a" but not as part of a word. Movies Expert has the restriction not to draw any individual words. But as BB says, those are fine for the words 'a' and 'I' in other rooms. By the way, thanks for posting the very comprehensive chart !